Dr. Wendy Chung with a young patient. 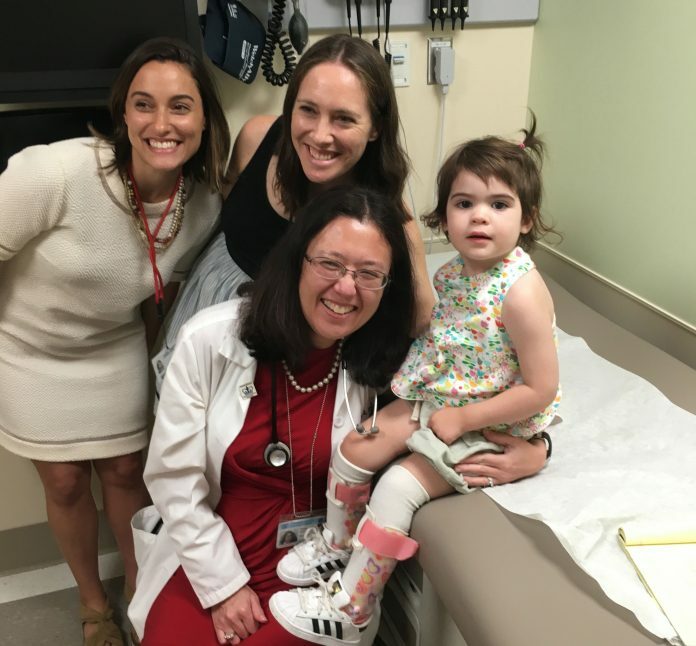 Susannah Rosen, a three-year-old girl living in New York, has an extremely rare genetic disorder—a mutation in the gene KIF1A (Kinesin family member 1A), which causes a neurodegenerative disease. There are less than 30 children around the world diagnosed with this condition. The rarity of this disease means that it was difficult to get a diagnosis. “From very early on, around birth I guess you could say, we were concerned because she wasn’t meeting certain milestones,” said Susannah’s father, Luke, a 38-year-old playwright. But their daughter’s doctors were stumped—they could not identify her condition. So when a neurologist suggested whole exome sequencing, Luke and his wife, Sally, agreed. Wendy Chung, M.D., Ph.D., a medical geneticist and the director of the clinical genetics program at Columbia University Medical Center, started the DISCOVER (Diagnosis Initiative: Seeking Care and Opportunities with Vision for Exploration and Research) program around three years ago to help patients with rare genetic disorders. Through this program, a team of various healthcare professionals work together to get a patient a diagnosis, provide treatment, and help coordinate care. A major part of this process involves analyzing a patient’s genome in order to find the genetic underpinning of their disease. The core group at DISCOVER includes Dr. Chung, another medical geneticist, a counselor, a nurse practitioner, a genetic counselor, and a social worker. This group is also supported by a larger network of 50 medical specialists who help assess patients and provide guidance on how best to treat and support them. Approximately a third of the families that come to DISCOVER eventually receive a diagnosis. Yet even with the best tools, a diagnosis is not always possible. There are still cases in the program that remain unsolved, although it is clear that there is a genetic cause. For example, two such cases include twins with identical challenges, and three brothers presenting with the exact same issue. “I can’t imagine [these cases] are not genetic, but we haven’t figured it out yet,” Dr. Chung said. To date, Dr. Chung and her team have identified around 34 new genetic diseases. In addition to identifying new conditions, the program also invests in research to further understand the disorders and develop new treatments. This often involves using CRISPR/Cas9 gene-editing technology to reproduce patients’ mutations in mice, creating animal models to more closely explore and analyze these diseases. “There’s a lot that we still need to learn about many of these conditions, so we don’t stop with just getting a diagnosis,” Dr. Chung said. Many of the patients who enter the DISCOVER program are one of only a handful of individuals in the world diagnosed with the disorder. In fact, some are an “n-of-1,” the first identified person with a condition. Many of these patients, like Susannah, are children. There is often not much known about these diseases, and as a result, many do not yet have a cure. However, with inputs from individuals with a wide range of medical expertise, as well as additional in-house research, patients can receive novel, individualized treatments for specific conditions underlying the disease. “What the DISCOVER program has really taught us is that with a disease that there’s not much known about at all, what we can do is treat the little diseases within the big disease,” Luke said. For Susannah, this means that while doctors cannot yet cure her condition, they can help control some of her symptoms, which include seizures, spasticity, and optic nerve atrophy. Another goal of the DISCOVER program is connecting patients with others in the world with the same rare disorder. Susannah’s family, for example, has been able to connect with more than 20 other families around the world whose children have the same condition. Since its inception, hundreds of patients have come through the DISCOVER program. The team sees around two families each week, and Dr. Chung hopes to scale-up the program in the future in order to help more people in need. Though Susannah is still waiting for a cure, Luke has since put his career as a playwright on hold to start a non-profit for KIF1A. With the help of Chung and her team, the organization’s website has become an invaluable resource for other patients with KIF1A genetic disorder.